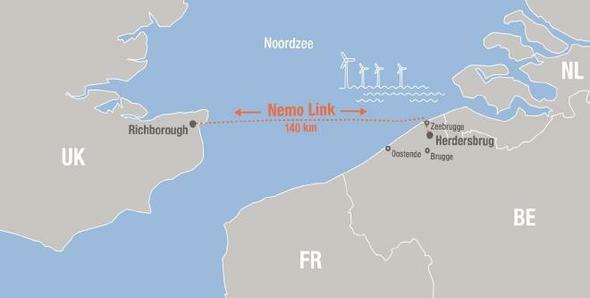 After a 10-year development and construction phase, Nemo Link's commercial exploitation will start. The transmission cables between the two countries are 140 km long and cover a 130 km stretch in the North Sea and connect converter stations in Richborough (UK) and Bruges (BE), each of which is integrated into its respective national grid. This marks an important step in the set up of a connected European grid. It will help sending electricity made of renewable energy to where it is needed the most. Chris Peeters, Chief Executive Officer of Elia, said: "In energy terms, the interconnector will offer a better future for consumers in both countries and facilitate the transition towards a sustainable and affordable electricity system. It will also give us more ways of guaranteeing security of supply. The commissioning of the Nemo Link, combined with that of the ALEGrO connection, scheduled for next year, will significantly boost our energy exchange capacity and position our infrastructure at the heart of Europe's future electricity system."